This playful desktop crab sculpture started out as vintage silverware: It’s handmade from forks. There are more than 4,500 thousand species of crabs. This one, in the genus uncommonae is the cutest. (Scientifically speaking, of course.) 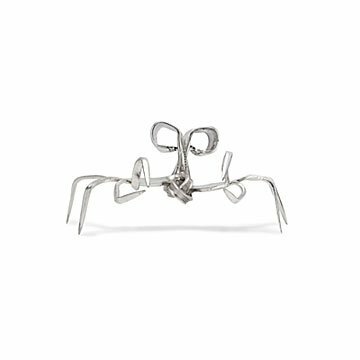 Handcrafted by Doug Heifetz, each creative crustacean is formed by fusing together two vintage silver-plated forks. Doug selects pieces of silverware to start each design (so every crab is unique), and then transforms their handles into eyes and the tines into legs and pinchers. Put one on your desk to brighten your day next time you're feeling a little crabby, or give one to friend who's helped you out of a pinch. Handmade in Maryland, the crab capital of the US. Doug Heifetz's metal art celebrates imaginative reuse and transformation. By salvaging old metal objects (especially pieces of silverware) that were once forgotten and irrelevant, he gives them new meaning. The artist began experimenting with metalworking while searching for crafts to share with his family, friends, and congregation. At the time, he was the full-time Rabbi of a Reconstructionist Jewish synagogue in the Washington-Baltimore area (where he served for 11 years) and he wanted to use art to bring people together. Now that he’s turned his passion for creating into a profession, Doug uses traditional silversmithing techniques to transform his materials into new shapes, while working to ensure that the original recycled objects remain recognizable. His finished pieces showcase “the mundane artifacts” in lustrous, often surprising new forms, encouraging viewers to look for hidden possibilities in the world around them. He lives in Silver Spring, Maryland, where he diligently produces each of his creations by hand.